Getting a dog is one of the most important decisions you’ll ever make. If you already own a Schnauzer or are thinking of getting one of these wonderful and unique dogs, then the new Schnauzer Handbook, published in 2012, is the only book you'll ever need. Why your Schnauzer’s coat is changing color? Whether to spay or neuter and what effect it will have on your Schnauzer? The answers to these and dozens of other questions are all are at your fingertips in the new Schnauzer Handbook. 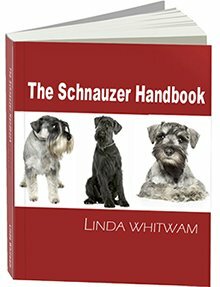 I run a leading schnauzer website and have spent many months researching, writing and producing images for The Schnauzer Handbook. The finished product is completely unique, there simply is no other book with so much practical info dedicated to all three types of Schnauzer. 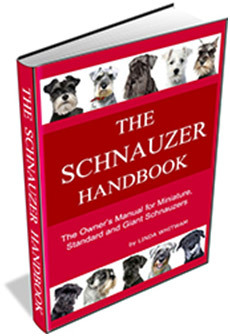 The Handbook contains over 250 pages packed with information and tips on Miniature Schnauzers, Giants and Standards. The easy-to-read and visual style is suitable for anybody aged 10 to 100. The book features over 300 photographs and graphics and draws on the experience of canine experts, championship breeders and schnauzer owners. "A thoroughly interesting and entertaining book. There’s hardly anything about schnauzers that isn’t in here - it even made me smile! The photos and illustrations are first class and the chapters on Puppies and Behavior were particularly enlightening I wouldn’t hesitate to recommend it to anyone who already has - or is thinking of getting - a schnauzer." BUY NOW and get your free gift**! Giant Schnauzer Caesar's story and the unbelievable 9.5 million- to-one coincidence! Miniature Schnauzer Koty’s story from Missouri, who sure is "cute enough." The amazing story of three-legged Skippy. How little Mini Chloe is helping her disabled owner to enjoy life. And six other heartwarming and funny stories of these wonderfully special dogs. 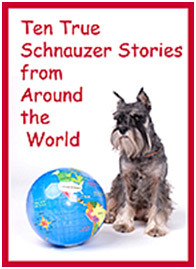 "If you love schnauzers like I do, you'll love this book. It is comprehensive, interesting and fun. Every page is packed full of information and pictures and it certainly sheds light on some of my schnauzer's behaviour! I also really enjoyed the stories in the free gift. If you're only buying one book, I'd say go for The Schnauzer Handbook, it's got everything you need to know in one place." How do I select the best food for my dog? How much should I feed my Schnauzer? What’s the best food for a Schnauzer with allergies? My dog is getting older, do I need to change his food? Find the answers to these and so many other questions in The Schnauzer Handbook. Read feeding charts for Schnauzers, based on weight and age, as well as the calorie counter chart to make sure your best friend doesn’t become overweight. The book contains countless tips to help you, your family and your Schnauzer enjoy a happy and healthy life together. What are some of the ailments which may affect Schnauzers and how do you know if your dog is not feeling well? You might not know it, but your dog CAN talk to you. A change in your dog’s behavior or habits can be a sign that something is amiss. Acting quickly can often be the difference between a successful or unsuccessful outcome for your dog. I write from experience. When our Schnauzer Max became ill at four years old, we quickly recognized a change in him and took prompt action. Three and a half years later, Max is fit and full of life, having survived T-cell lymphoma, a particularly aggressive form of canine cancer. The Four Vital Signs of Illness. If you can recognize symptoms of ill health early on and take swift action, you can improve your Schnauzer’s chances of a good outcome. If you’re lucky, you might be able to prevent a chronic condition from developing and save many hundreds of dollars – or pounds - in long-term veterinary bills. "A charmingly-illustrated guide to schnauzer ownership, I loved this book. It tells you all you need to know about the breed and how to look after your pet. Whether you are thinking of getting a schnauzer as your companion or whether you are already familiar with the joys of these super dogs, this book is a must." 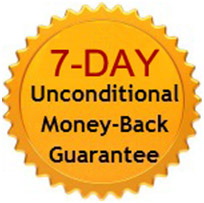 If, for any reason, you are not satisfied with The Schnauzer Handbook, I offer you an unconditional 7-day 100% refund. You can't lose on this deal. Click here to see the answers to some frequently asked questions. You can’t choose your relatives, but you can pick your long-term companion! Getting a Schnauzer puppy is a life-enhancing experience. They will become part of your daily life for 10 to 15 years, if you are lucky. Schnauzers love people. Not only will they become part of your family, but you will become theirs. They will want to be with you and will love you unquestioningly. The Schnauzer Handbook will help you select the right puppy for you and your family. These and many other topics are covered throughout the book and in the 32 pages of the Puppies chapter. 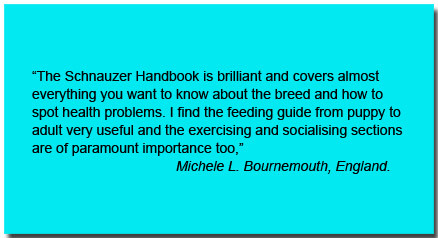 "Very thorough, visually appealing and readable book on schnauzers with plenty of resources for our family." "This is a great book for a family with a schnauzer! I love it,"
Owning a Schnauzer is one of life’s most rewarding experiences. The Schnauzer Handbook will guide you through to help you become a good owner and enjoy many happy years with Man’s - and Woman’s - Best Friend.